By Philip Girard, Jim Phillips, and Blake Brown. Published by the University of Toronto Press. 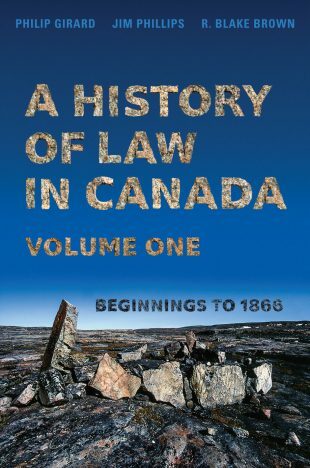 This book, the first of 2 volumes, presents the history of law in what is now Canada, from the first European contacts with northern North America in the very early sixteenth century to immediately before Confederation. Divided into four parts, the book first looks at the roots of Canada’s three legal traditions, Indigenous, French and English, in North America, France and England. Part 2 examines the period down to 1701 and the signing of the treaty known as the Great Peace of Montreal in 1701, during which New France was established. Part 3 deals with the eighteenth century – Anglo-French conflict, New France until 1760, the establishment and growth of English colonies of settlement, and, throughout, relations with indigenous peoples and governance of indigenous nations. Part 4 is devoted to the British North American period, after 1815. Indigenous people are central of the narrative throughout, including after 1815 when their influence waned as their land base was largely lost in central and eastern Canada. Included in Part 4 are the Red River settlement and early British Columbia. Although the background to this history are the well-known major political, military, social and economic transformations of this part of North America, the book is principally a legal history set against and integrated with that background. Court systems, the judiciary, the legal professions, are dealt with in every period and for each of the legal traditions, and the areas of law covered include criminal, family, constitutional, commercial, land, succession, and civil and criminal procedure. This volume combines the remarkable flowering of scholarship on Canadian legal history, so much of it fostered and published by the Osgoode Society over 35 years, and much new research.